Student-teacher interaction is essential in online courses. Online courses require rich content that includes many modalities for students to choose their learning path, including text, audio, video, kinesthetic and other modes. This is one of the features of online learning that is difficult to produce and separates from traditional classroom learning. Learning in most classrooms is largely auditory with some visual aspects. Once kids know how to read, we largely teach through talking and listening. The individualized tracks allow students to slow down or speed up their learning. If they want to watch a video to learn the content, they can. If they want to read, they can do that. This freedom is essential because it’s possible. 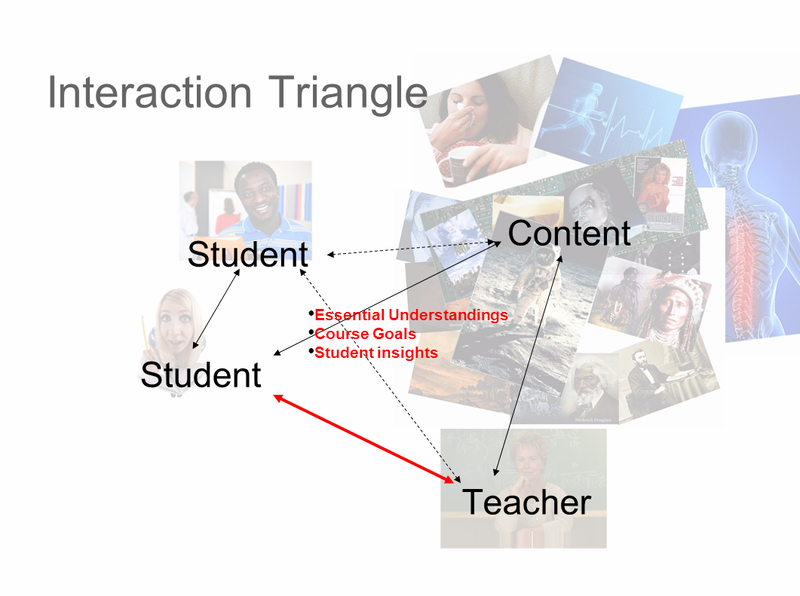 The above chart shows a triangle where students interact with the content as they would in any course through essential understandings, course goals, the insights they develop. Teacher student interaction occurs through email. Online discussion boards are excellent ways for teachers to give every student feedback and additional ideas to consider. This is not possible in a traditional classroom, where discussions are dominated by the articulate few. Additionally, online sessions using video conferencing allow teachers to further explore concepts, assess students’ understand, and clear misconceptions — the essence of what teachers do in a traditional classroom. Further another part of the triangle includes student-to-student interaction. This can occur through group projects, discussion boards, and discussions in video conferencing software, among others. A strong combination of content, interactions with other students, and active interactions with their online teachers, students in virtual programs (online/blended/etc) can be successful. “What’s revolutionary for adults is normal for kids,” stated Jaime Casap of Google to technology leaders at a meeting of the Illinois Chief Technology Officers today. Casap implored school leaders to build great teachers, appeal to students’ motivations, focus on the basics, and prepare students for more education after high school, although not necessarily a four year college. While many adults look for printed documents to learn new ideas, children look for YouTube videos for instruction and feedback on their skill development, Casap argued. Times have changed: revolution to normal. Casap weaved stories from his life into his presentation about how education changed his opportunities. He made his case for developing important skills like communication, collaboration, and critical thinking, among others that cannot be assessed easily. Even with these opportunities he is concerned that the digital divide is growing larger. While cell phones have allowed more people to have Internet access, wired broadband is the true future of rich media digital learning. Broadband is lacking in homes of low-income families. 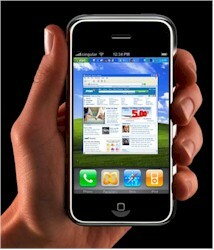 It is hard to fill out a job application or write a paper on a smart phone. Standing at the edge of this revolution, children are eager to address their normal. The Illinois Chief Technology, NFP is a non-profit corporation that provides professional development for K-12 technology leaders in Illinois. We need leaders who can work with the education community and the “education reformers, proponents of ” the status quo” and the “change agents.” Finances, changing demographics, and performance measures are putting pressure on the current system. We need change, but is it “market-driven” change? Does market-driven change focus on students and their interests or is focus on profits? Does market-driven change focus on creating a market through universal standardization or relationships with students? The press to “deregulate,” or unbundle education in the current reform language, is wild and wide open. In a recent working paper, Creating Healthy Policy for Digital Learning, the Thomas B. Fordham Institute opens the throttle for the deregulation of education. Again, I offer that I am a proponent of all kinds of options of learning for students. Some students excel in classrooms, some do not. Some schools are blue-ribbon, but others are broken, in chaos and lawless. Students who do not learn at the rate of the pace of the dictated curriculum can be left behind. Those who can work faster are bored. 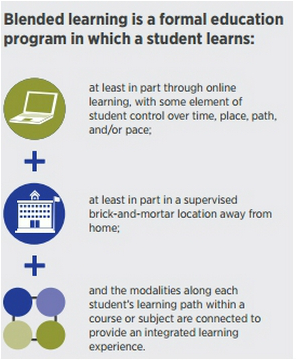 Virtual schooling and digital learning allow students to take classes not available locally. I will further write that I am now a former school administrator, technology director, and e-learning director in a large suburban school district. 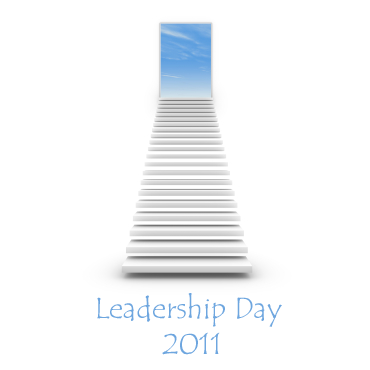 I have seen great leadership. I have seen great collaboration. I have seen adults working on behalf of students. Yet, I know that within the constraints of state laws, federal laws, union contracts, time and money, every student is not fully served. There’s just not enough resources to serve every student. While schools address the regulatory constraints of their reality, a small but growing group, harps at change through the market. We need leaders who can press through this, pragmatists who pull the partisans together for the benefit of kids. Virtual classes can allow students to progress at their own rates. In a virtual setting, I have seen high-performing middle school students cross math sequences by completing a year of mathematics in six weeks. In their next course, they do as well as students who took a year to learn the prerequisite material. I have also seen students and had private conversations with school personnel about students unsuccessfully recovering credits online. Further, I worked in a program where over 90% of the students recorded “A,” “B,” or “C” in their online courses. Online learning is not for everybody. Even the blended models offer stiff challenges to underperforming students. The deep thread of the Fordam paper is to make a market out of education through the Common Core. While finding flaws in the separate state assessments under No Child Left Behind, the paper proclaims success in uniform Common Core assessments through electronic learning, moving assessments from bubbles to clicks. While the paper encourages the use of growth models, the core issue is the deregulation of education so that it can be turned into a nationwide market. In the first point is criticism of teacher certification. Clearly the paper doesn’t like it. So we’ll let anybody fly a plane, operate a nuclear reactor, or argue a court case? No licensing or examinations required. Not everybody can teach; it takes a special heart on a special mission, yet teaching online is different from in a classroom. Some certification requirement factors are nonsense, but prospective teachers must show appropriate skills. Should the Common Core be mandated along with a national Common Core exam, a national certificate may be appropriate. Second point, the paper supposes that the Common Core is better than individual state standards. This creates the single market for content providers. It is interesting that this is a move toward more standardization using technology, when we educational technologists proclaim that technology allows diversity and personalization. They are certainly not parallel thoughts. Early in the paper, the notion is expressed that [v]irtual school’s greatest power is that it creates the opportunity to reconsider what is feasible. I ask for whom? Students or the market. No where in the paper is the issue of collaboration, communication, or critical thinking addressed — the issues that a global economy require but cannot be tested in a bubble or through a click. In this proposed market-driven purpose, students would not be asked to demonstrate to solve problems, collaborate on issues, and other issues that technology-based learning can facilitate. The deregulation of education is about more standardization of content, not about what students are learning. After all it’s a market and students can be tested with a click. One of the realities is about a basic premise of the paper, [S]tudents in a given building or district may be taking courses (or just sections of courses) from a variety of providers, each with varying approaches to technology, instruction, mastery, and so forth. The marketplace is about commanding it not sharing it: betamax v vhs; iOS v. Android. Look at SIF (Schools Interoperability Framework). This is an attempt to share data across different technology systems, a system not largely adopted in school districts technology departments. Essentially, SIF is a failure because of its non-adoption, an example that the market cannot solve the simplest issue in education — sharing data among systems produced by that market. The global market is full of non-compliance. There’s no marketplace example that learning objects (sections of courses) from different providers will easily fit in the system the paper proposes. Every company has its own proprietary system. Standardize to their system or go elsewhere. Can I take a water pump from a Ford and put it on a Chevy? That’s what this means for learning objects. The parts won’t mesh. Clearly, the providers won’t build their systems and content around open source or sharing it easily. Then it would not be a market. Further, the traditionalists who insist that school cannot change; that kids can only learn after they are disgorged from the big bricks of cheese and only between bells are delusional. 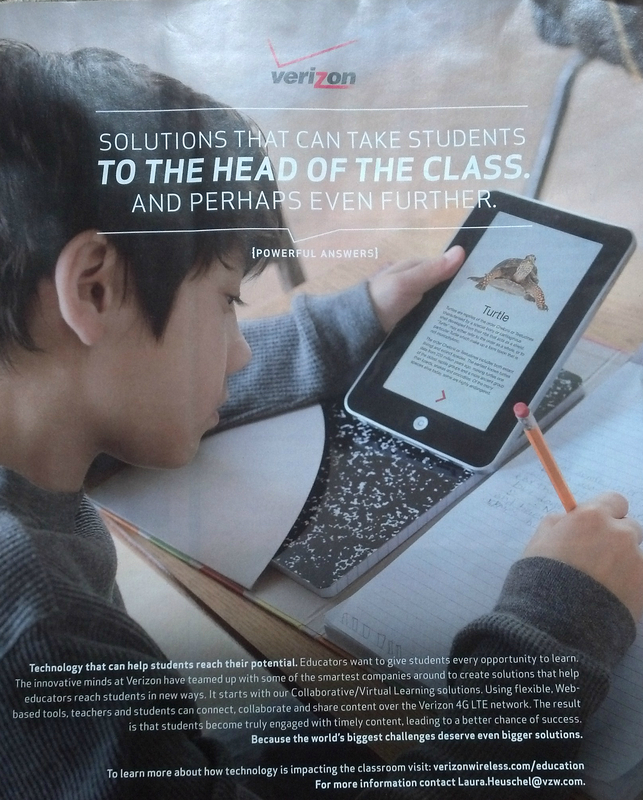 Technology continues to be integrated into schools to continue to do the same old things. Technology integration is a waste of time and money, with few measurable results. The traditionalists march, tweet, and cry that the reformers want to hurt kids and take teachers’ jobs. The reality is that education is one of the last industries that has not been radically changed by technologies and changing requirements of the world. Every time schools want to start a new initiative or receive a mandate, they rearrange the deck chairs of school based on the ancient notion that kids learn at the same rate and that learning must occur at occasions that adults designate. Does it matter if a student can complete the requirements of 3rd grade in 6 months and those of the 5th grade in 18 months? If a student can complete a math requirement in 6 weeks, that should be encouraged and celebrated. The system needs to change to make this happen. We need leaders who will poke through the rhetoric of the marketplace and the traditionalists to show us how to structure schools differently around what’s learned, not around the required days and hours of school. We need leaders at the national and state levels who will organize, confront the partisans and take learning to new levels that technology provides with many stakeholders supporting a new system. As I wrote a year ago, we need leaders to take us to new levels and that bubbles and clicks won’t do. Forward is not far enough.